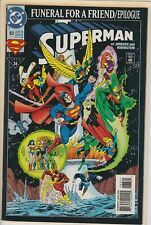 Superman #83-88 NM Run (DC,1993-94) Funeral For A Friend/Epilogue! JLA, Bizarro! DC Comics The Adventures of Superman Comic Book Lot 1993 Reign of the Supermen! This page was last updated: 24-Apr 11:38. Number of bids and bid amounts may be slightly out of date. See each listing for international shipping options and costs.